Article written by Courtney Baugh, a senior studying Arts Management through SPEA at Indiana University. This summer Courtney has internships with the Eiteljorg Museum of American Indian and American West, and the Hawaii Performing Arts Festival, while also serving as a student representative in the IU2U Program. Check out her first blog post here. Courtney jumping from South Point. Photo taken by Vanessa Dove. 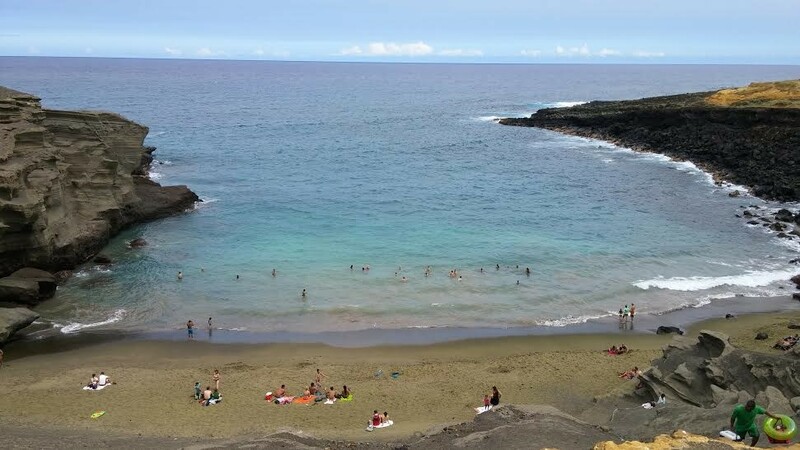 The Green Sand Beach, located near South Point. Photo taken by Courtney Baugh. The glow from the crater at Volcano National Park. Photo taken by Courtney Baugh. Well, it’s here, my second and last official day off. As you might be able to guess from my first blog post, working at a festival, especially a music and performing arts festival, can be hectic and draining. Many long days have happened since I have last wrote, so I am excited to have a day off. Being an intern at the Hawaii Performing Arts Festival can be demanding, but when you see the final product, it all becomes clear on why we have been working so hard. So far, we have had numerous concerts, both vocal and string, and every time I have been incredibly impressed with the result. Seeing the participants on stage makes you realize that all the hard work and long hours are well worth it. I cannot wait to see the upcoming concerts and performances, including the full production of Into the Woods (probably the performance I am looking forward to the most!). But for today, it’s my time to relax. Since arriving to Hawaii, many of my friends have been asking about what I’ve been doing, and quite honestly the answer is mostly working (although, I do have to admit, I have seen my fair share of beaches while being here). That is why I am so excited to have time to explore the Big Island, particularly the areas I have not seen yet, like the southern half of the island. Waking up early, a few friends and I decided to head down to the southernmost point of the United States. South Point, or the Point, is known for a couple things amongst locals—the green sand beach and “the jump”—both of which we decided we should do. The first was “the jump.” Now you might be asking what “the jump” is, and as you can probably guess, “the jump” refers to jumping off the Point. But what you might not expect is that it’s a jump off a 40 foot cliff. Casual, right? 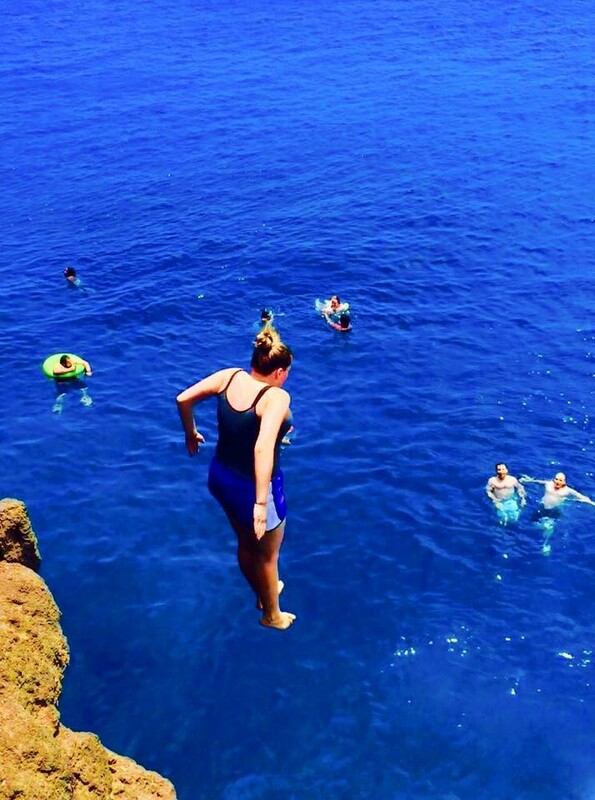 But as I was in Hawaii, I decided that I had to jump and although skeptical before, after jumping, I can say it was an awesome experience that I would definitely do it again! Right after that, the three of us decided to head to the secluded green sand beach just a few miles away. To get to the green sand beach, you have to drive through fields to a parking lot. From there, it’s a short three mile hike to the actual beach. While you can pay locals to take you in a four wheel drive truck, we headed out by foot. Once there, I saw what all the hype was about. The beach, probably my favorite in Hawaii, features gorgeous green rocks and sand, powerful yet playful waves, and secluded bay. It was truly something special. If not for the two hour car ride, I would go there every day I could. After a few hours at the beach and our hike back to the car, we jumped in our car and headed to Volcano National Park to see the crater at night. While it was a short trip at Volcano, it was a very unforgettable one. 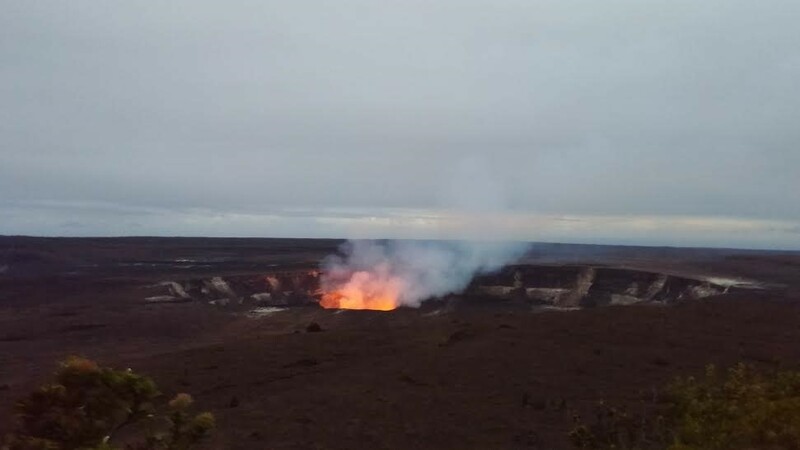 The glow from the lava was an incredible sight that I would recommend to anyone heading to the Big Island. After admiring the spectacular glow for a while, we headed back home, making a full loop around the island. My day off was one that I will never forget, but now that I am recuperated and have seen much of the island, it’s back to work! I cannot wait to see what the remainder of the festival brings. No matter what, I know it will be something special. Stay tuned for an update on last few weeks of my internship and the remaining Hawaii Performing Arts Festival performances.